Assuredly, demonstrating a negative attitude with clear absences of transparency, prime examples of high-handedness and pellucid cases of disinterest is tantamount to courting disaster, and has contributed the demise of many. 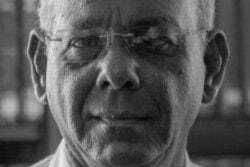 Heads of organisations, sport not being the least among them, have been known to hasten their downfalls with such carefree acts of indiscretion. On Wednesday, April 13, 2016, the Stabroek News sports editor carried a story headlined: ‘Chess Federation to stage AGM May 15 – Greenidge’. The news came as a surprise to the chess fraternity, except, of course, for a selected few. 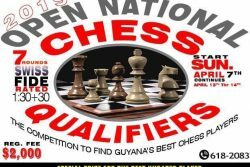 The constitution of the Guyana Chess Federation (GCF) states, unambiguously, in part, “The annual general meeting, of which at least four weeks prior notice shall be given, will be held not later than March each year.” Traditionally, from the inception of the first annual general meeting in the early 1970s, a notice was published in a daily newspaper by the GCF to alert the public of its intent. The column is not aware this has been done. It seems as if a 2016 annual general meeting for the election of a president and his or her office bearers, was intended to be shrouded in secrecy. Why wasn’t notice of the AGM posted on the Federation’s website or on its Facebook page? Farley for President! Darkly handsome, and exuding an air of assuredness whenever he sits at the chessboard, Frankie Farley (in photo), feels his imminent obligation is sharing his expertise with the younger generation of chess players. He theorizes there is a chess grandmaster sauntering around in our midst, but we have to find him or her. 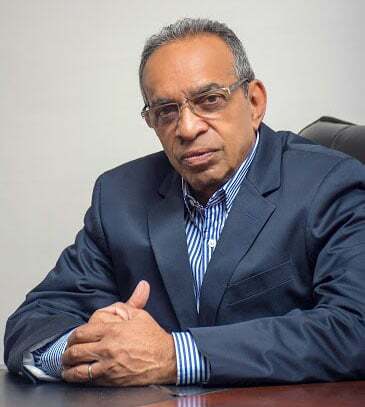 Farley is, therefore, seeking the distinguished presidency of the Guyana Chess Federation, with the intention of creating ‘a new beginning’ for chess aficionados; a beginning of confidence, trust and faith. Only financial members of the GCF are allowed to vote at the annual general meeting. But no one knows who the financial members are. Anyone can be certified as financial at the appropriate hour. The list of the financial members should be posted. On the other hand, in the event one wishes to become a financial member prior to the election, how can one do so? Where should you go? Such information should at least be posted on the GCF Facebook page. 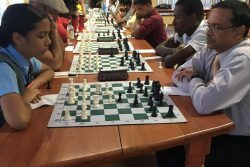 During the recent surprise Engineering Construction Incorporated chess tournament, no mention was made of the AGM, although members of the Federation were in attendance. This inelegant abstention of urgent notification of the meeting, makes one wonder. It makes the column wonder whether there is credence in the word of a staunch chess supporter, that, perhaps, there is a shrouded move, similar to an irregular en passant one, to hijack the election on behalf of a select few. But however lopsided things may appear, chess is a cerebral game, and the people who play it, are populations of thinkers. The column remains confident therefore, that the administration for chess can overcome its difficulties and simultaneously, contribute additional pizzazz to the ancient brain game. The stimulant is required, because chess is a struggling also-ran sport. No one has been successful in transforming the sport into a mass-market, and commercial one in the world at large. Chess is screaming to be recognized as a commercial, in addition to an intellectual, enterprise. 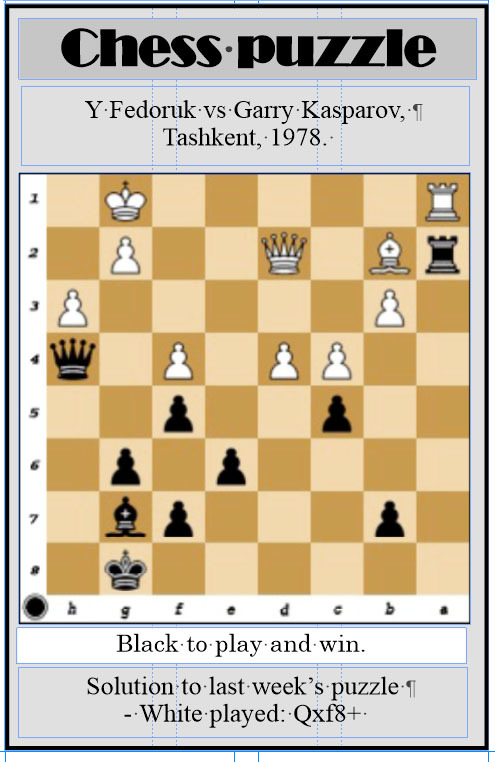 And this is what Frankie Farley has indicated he will attempt to accomplish on the local chess circuit, once he is allowed an opportunity to lead chess into the future. 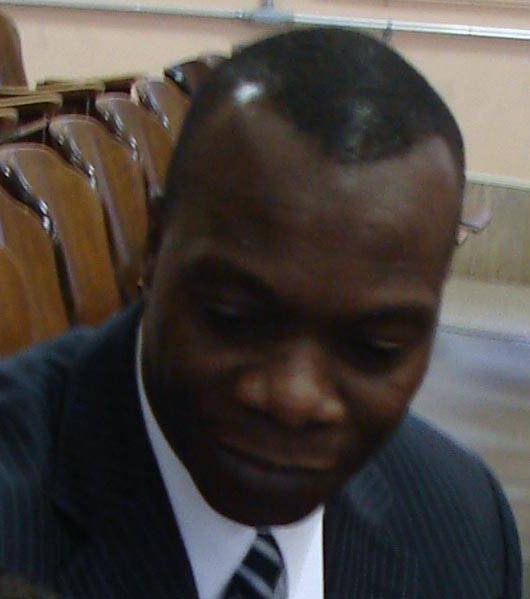 Therefore, the column wishes to announce the candidacy of Frankie Farley for the post of President of the Guyana Chess Federation. The candidate is the Chief Executive Officer of Silicon Green Incorporated. Farley graduated with a Bachelor’s degree in Architecture and Civil Engineering from the University of Guyana and completed additional studies in Construction Management in New York. He resided in the US for a lengthy period and played tournament chess far and wide in that country. Since his return from the US, Farley has been a recognised staple on the local chess scene and is known to tournament chess participants. 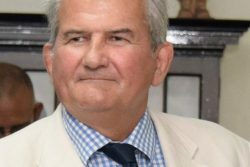 He acknowledges that it is difficult to succeed in chess at the championship level and that is the reason grandmasters are a rarity when juxtaposed to other esteemed players in other sport disciplines. In the English-speaking Caribbean, only one chess grandmaster exists – the inimitable Maurice Ashley of Jamaica. 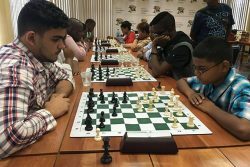 Ashley became the first black grandmaster in the history of the enduring mind game. However rare grandmasters are, Farley noted, we have to make chess attractive to sponsors. It gives one the opportunity to be associated with intelligence, discipline and cunning and is therefore worth digesting. If he is elected, Farley wants to attract deep-pocket sponsors to the game thereby increasing and improving the numbers of chess players locally. 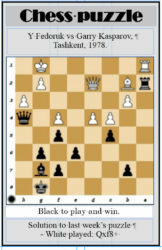 The following games were taken from the Ultimate Blitz Challenge in which Garry Kasparov opposed the three top finishers of the US Championship: Caruana, Nakamura and Wesley So in St Louis. e4 e5 2. Nc3 Nc6 3. Bc4 Nf6 4. d3 Bc5 5. f4 d6 6. Nf3 exf4 7. Bxf4 O-O 8. Bg5 h6 9. Bh4 Be6 10. Bb3 Nd4 11. Rf1 Nxf3+ 12. Qxf3 Bd4 13. Ne2 Bxb2 14. Rb1 Ba3 15. Nf4 Bb4+ 16. Ke2 Bg4 17. Qxg4 Nxg4 18. Bxd8 Raxd8 19. Ng6 Bc5 20. Nxf8 Rxf8 21. h3 Nf6 22. c3 Bb6 23. Rf5 Re8 24. Rbf1 c6 25. Kd2 Re7 26. g4 d5 27. exd5 cxd5 28. Bxd5 Be3+ 29. Kd1 Bg5 30. Bb3 b6 31. Re1 Rc7 32. Kc2 g6 33. Rfe5 Kf8 34. Rf1 Kg7 35. d4 Bh4 36. Kd3 Bg337. Re3 Bh4 38. a4 Nh7 39. a5 Ng5 40. axb6 axb6 41. Bc4 Ra7 42. Rb1 Rb7 43. Rb5 Bf2 44. Re8 Nxh3 45. Ke2 Bh4 46. Kf3 Ng5+ 47. Kg2 Rc7 48. Rb4 Nh7 49. Kf3 Bf6 50. Ke2 Be7 51. Ra4 Nf6 52. Rb8 Nxg4 53. Rxb6 h5 54. Rba6 h4 55. Ra7 Rxa7 56. Rxa7 Kf6 57. Bd5 Nh6 58. c4 Nf5 59. Kd3 g5 60. c5 g4 61. c6 Bd6 62. Rxf7+ Kg5 63. c7 Bxc7 64. Rxc7 h3 65. Rh7 Nh4 66. Be6 Ng6 67. Rg7 h2 68. Bd5 Kf6 69. Rxg6+ 1-0.
e4 c5 2. Nf3 e6 3. b3 b6 4. Bd3 Bb7 5. O-O Nf6 6. e5 Nd5 7. Be4 Qc7 8. Re1 Be7 9. Bb2 b5 10. Na3 a6 11. c4 bxc4 12. Nxc4 O-O 13. d4 Nf4 14. Qd2 Bxe4 15. Rxe4 Nd5 16. dxc5 Qxc5 17. Rg4 Kh8 18. Ng5 Nc6 19. Ne4 Qa7 20. Rd1 a5 21. Nf6 Nxe5 22. Nxd5 Nxg4 23. Nxe7 f6 24. Nd6 a4 25. h3 Nh6 26. b4 Qb6 27. Rc1 a3 28. Ba1 Rab8 29. Rc4 Qd8 30. Nec8 Nf5 31. Qc2 Nxd6 32. Nxd6 Qe7 33. Qd3 e5 34. b5 Qe6 35. Qxa3 Qd5 36. Rc1 Ra8 37. Qb4 Rxa2 38. Bc3 h6 39. b6 Ra6 40. Rb1 Rb8 41. b7 Qxd6 0-1.
e4 e5 2. Nf3 Nc6 3. d4 exd4 4. Nxd4 Bc5 5. Be3 Qf6 6. c3 Nge7 7. Bc4 Ne5 8. Bb3 d6 9. O-O O-O 10. f3 N7c6 11. Kh1 Bb6 12. Na3 Kh8 13. Qd2 Na5 14. Ndb5 Bxe3 15. Qxe3 Qe7 16. Bc2 a6 17. Nd4 c5 18. Ne2 Nac4 19. Nxc4 Nxc4 20. Qc1 f5 21. b3 Nb6 22. c4 fxe4 23. Bxe4 Bf5 24. Ng3 Bxe4 25. Nxe4 Rad8 26. Re1 Rfe8 27. Qd2 Qf8 28. Ng5 Qf6 29. Rxe8+ Rxe8 30. Re1 Rxe1+ 31. Qxe1 Nd7 32. Qe8+ Nf8 33. h3 Kg8 34. Ne4 Qf4 35. Qe7 Qc1+ 36. Kh2 Qf4+ 37. Kg1 Qc1+ 38. Kf2 Qb2+ 39. Kg3 h5 40. Nxd6 h4+ 41. Qxh4 Ng6 42. Qe4 Qf6 43. Nf5 Qg5+ 44. Kh2 Nf4 45. g3 Nh5 46. f4 Qd8 47. Qd5+ Qxd5 48. Ne7+ Kf7 49. Nxd5 1-0.